Looking for a nontoxic replacement to harsh, drying, conventional makeup remover wipes? Look no further! These are easy-peasy and work like a charm. 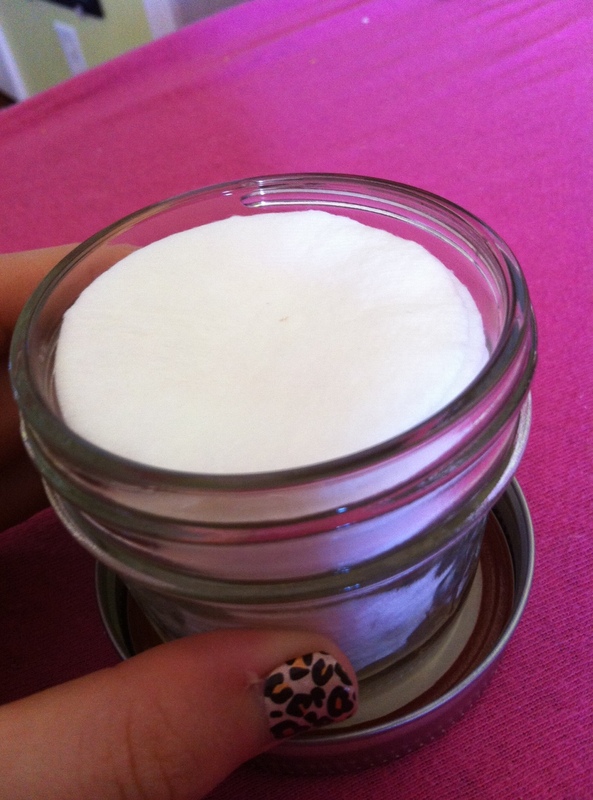 Place cotton rounds in your mason jar. In a glass measuring cup, add your coconut oil, castile soap, and essential oil. Prepare some hot water, and use it to fill the measuring cup to the 1/3 mark. Swish this around to dissolve the coconut oil and mix thoroughly, then pour over the cotton rounds. Make sure they all are thoroughly saturated, you can add more hot water if need be. Once they are all covered, close the lid tightly. Tea Tree Oil is a great skin support oil for those dealing with acne without being harsh or overly drying. Lavender Oil is on of my favorite oils for skin. Adding it to your face wipes can help support dry skin and I find it feels so soothing. If you plan on using these before you go to bed, the aroma may help you feel relaxed and ready to sleep! Lavender may also help support the healing of acne and reduce the appearance of acne scars. Lemon Oil can support the appearance of a bright face and even skin tone, but don’t use this one right before spending time in the sun because as a citrus oil it can temporarily increase phototoxicity. Some other great oils are frankincense, cedarwood, orange, ylang ylang, and geranium. These are just a few suggestions to get you started, but explore and see what oils work for you and your skin! Have fun! Previous postMy Favorite EVERYTHING Cleaner!! Only use lemon oil at night or if you will be out of the sun as it is photosensitive. Absolutely! I usually try to post that reminder but I forgot to mention it this time. Thanks for pointing that out! Thank you for having a recipe for a small batch in a small container. Great idea to use a mason jar and cotton rounds. I have all of this at home now. Time to go try this! Awesome!! I hope it went well!! You should only use distilled water.